Governor Hindmarsh Hotel, Thu 22 Nov, 2018. 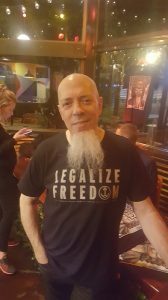 From America to Adelaide’s Governor Hindmarsh Hotel came the ever charming and ever virtuosic progressive rock keyboardist, Jordan Rudess on his first solo Australian Tour BACH TO ROCK: A Musician’s Journey. Furnished with a grand piano and an iPad the prodigious musician hosted an evening of eloquence and intrigue sporting some of the finest classical chops on the planet and armed with humorous anecdotal and historical accounts of his youth and career. The show started off with an improvisation fuelled with flowing melancholic and melodic (almost Celtic) sensibilities woven into a progressive tapestry of syncopated accents, time changes, and suspended arpeggios before visiting relative majors and turning the piece into an arrangement that everybody was sure to have been written. Upon the dissolving of the applause Rudess confessed, “First of all, I should tell you that I’ve never played that piece before because I just made it up. So we don’t know what it was and unless any of you recorded it we’ll never hear it again.” Fortunately, I was able to capture some of the piece. 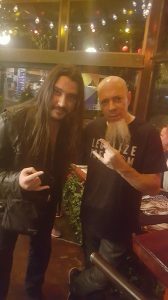 Click HERE to listen to the Jordan Rudess Adelaide Improvisation piece on SoundCloud. Over the following two sets, Rudess took us through the various experiences of his life accompanied by his own Foley, jovially performed on the piano. Rudess played classical works pertinent to his training and progressive rock classics that were his inspiration; some in flamboyant instrumental form and others such as King Crimson’s I Talk To The Wind and David Bowie’s Space Oddity on which, he sang – a pleasant change. 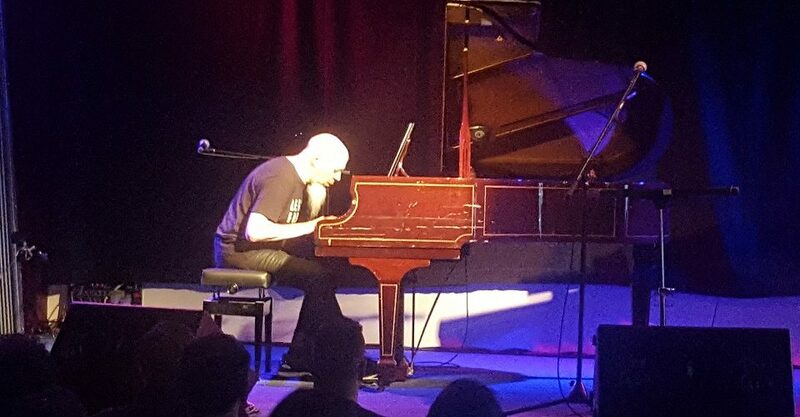 Midway through the second set, Rudess’ gave a demonstration of his newly developed synth instrument for iOS devices; the self-declared ‘marketing part of the evening’ where he performed a space age blues improvisation on an iPad with his nose. The night was an incredible display of musicianship and creativity packaged in a light-hearted delivery of musical comedy and narrative storytelling. Complete with space age nose-synth and an astonishing repertoire of progressive music skilfully arranged for solo piano (which at one point had the audience clapping to the pulse of an 11/8 meter), this gig had an abundance of depth and entertainment value in an intimate setting. Perfect for any fans of Jordan Rudess or piano music in general. Random Prog snippets from Jordan’s time with a KISS tribute band and Speedway Boulevard. An incredible display of musicianship and creativity! Bián Hickman is an award-winning songwriter, composer, performer and teacher with extensive experience in the contemporary music field. Since embarking on his first public performance in 2002, Bián has clawed his way to becoming a strong player in the South Australian music industry as well as boasting a Degree in Contemporary Music and Production. His personal pursuit for excellence coupled with a love for music and elegant prose offers a rigorous yet tender approach to his journalistic endeavours reflecting his genuine thoughts and feelings. Bián thoroughly enjoys writing for The Clothesline as well as his continued study of Music, Martial Philosophy and Exercise - In other words, life.